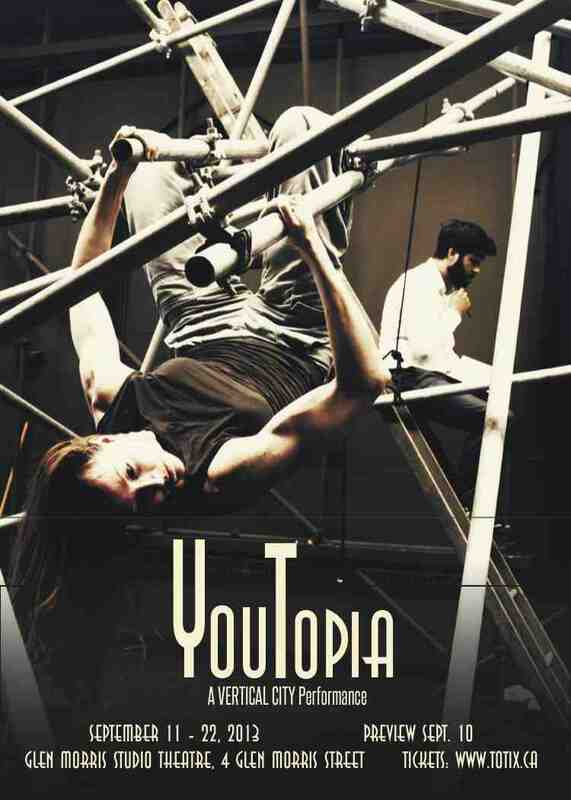 YouTopia is a solo performance in one sense, a duet in another, and ultimately an interdisciplinary and intermedial collaboration. A lone character – Kiran – spends the entire piece suspended above a water abyss within a twisted maze of scaffolding and ladders. The room is a consistent contradiction: conspicuously “modern” and “space age” designs and attributes (a la the late 1960s) sit side-by-side with countless efforts to fix, patch, and repair its aging and obsolescent features with whatever materials are at hand (twine, wire, duct tape, etc.) There is an ever-present sense that the space has lost its moorings – or maybe its willingness to sit still – and its seams and joints are under increasing pressure to shift and come apart. As a result, the room’s fixtures – sink, table, stove, toilet, etc. – have surrendered their grip on the ground, and have begun to lift and twist and travel throughout the space, equally suspended, and it is around this changing domestic configuration that Kiran weaves and reweaves her web. Kiran’s primary objective is to survive – to get from moment to moment and day to day by imposing as much structure and order as possible within a heaving, disintegrating environment. But to do the simplest of tasks – brushing her teeth, making coffee, sleeping – she needs to get from one area to another, to meet her fixtures where they are (for the moment) hanging in midair. Beyond that, however, she must also collaborate with the room’s “identity” – an aging artificial intelligence unit named AL that is equally under the duress of time and neglect, and thus equally desperate to survive. Sample of My Publication on Youtopia: “Subtle Spectacle: Risking Theatricality with Vertical City Performance.” About Performance (forthcoming 2014).